Today, we opened our own pretend cupcake shop! After reading Pinkalicious <–affiliate link! by Victoria Kann at nap time, we wanted to make our own pink cupcakes. This adorable book made both of us laugh out loud and my daughter wanted to read it over and over! 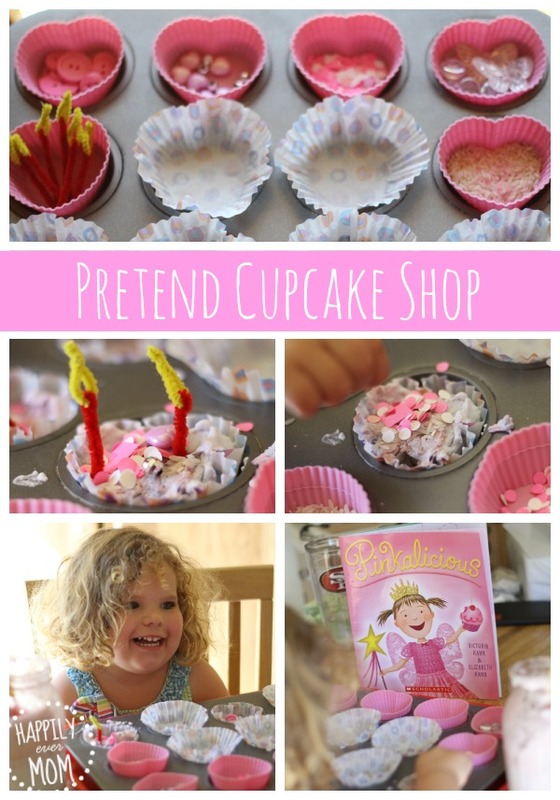 Since we loved making erupting cupcakes, I knew my daughter would love this sensory play. We just had to put one ingredient in the freezer to get ready to decorate pretend cupcakes! We were inspired by this way of playing with shaving cream from Growing A Jeweled Rose. Be sure to check out the recipe so you know how to make our cold, cupcake batter. We mixed our cupcake batter with some red food coloring in a jar. Note: The mason jar was difficult to scoop out the batter, try a container with a wider opening! Scoop out the frozen cupcake batter and add all of the toppings. Lil loved getting to put on confetti, buttons, and colored rice on top of the cupcake batter. 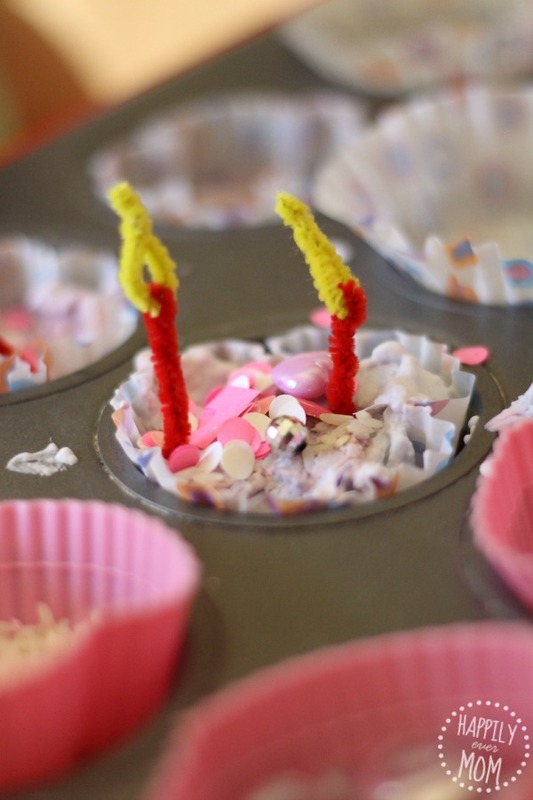 We even made pipe cleaner candles to go on top of each cupcake! After she made all of her cupcakes, we even made an ALL green dinner of broccoli and avocado pesto (you can find the recipe in Chloe’s Kitchen, an amazing vegan cookbook by Chloe Coscarelli) <–affiliate link – thank you for the support! Lil loved that we ate all green just like Pinkalicious! If you love this acitivity, be sure to check out how we made a bubbling rainbow and an edible rainbow, too! These are affiliate links – thank you for the support! Oh how fun! I know just the little girl who would have a blast with this idea! Thank you for sharing at our Pinning for Play link party!